Yesterday I mentioned I like to prime before caulking. It's easier to see where I need to caulk and it is so satisfying to see all the gaps disappear as I make progress. And believe me, I need all the motivation I can get when caulking because there is SO. MUCH. CAULKING. to be done in this house. I still haven't finished all the caulking in the kitchen and if caulking is bad, caulking above your head is like 500 times worse. Anyway, despite my dislike of caulking, it is so important when making things look finished. A lot of people think that paint will fill the gaps but it just doesn't. Take a look at the photo below. On the left is a primed and then caulked section while on the right is just a primed section. 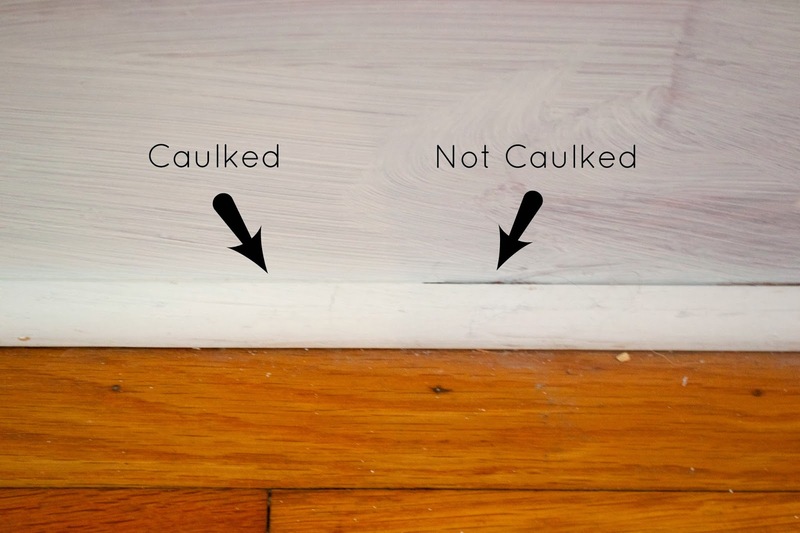 While it seems like it would take more time to caulk, you will spend so much more time trying to fill gaps with paint and it just will never look finished. It's a bit of a pain but it just has to be done. Everybody has their own tricks for caulking but my favorite is just to put a thin bead in the gap and then run my finger over the seam and use any extra caulk to fill in nail holes so I don't waste any. Since I'm painting everything afterwards, I don't bother taping anything off I just make sure everything is smooth and hit it with a little sand paper if a spot isn't smooth once it's dry. At the rate I'm going I'll be caulking in this house for the next few years so I better get back to it! What is a necessary but annoying task in your house?